Wanting some change in our life is common feeling that hits us all from time to time. Stable routine is something that quite often we all secretly long for but also something that after certain period ceases to be such a desirable quality and becomes a much hated fact. When this happens we are desperately looking for ways to break out of the routine and the only way to do this effectively is via changes obviously. Great thing about breaking the routine is that you do not have to drastically change your life to escape the routine. Sometimes all it takes is some great change. Quite often woman when need to break out of the routine change their hair color. Well, you can do that, or if you feel really really fed up with your routine you can change something about your home – you can change the color of your garage door. If that sounds too drastic and if you are afraid your neighbors will call you crazy if you do it, do not use any crazy colors and you should be fine. 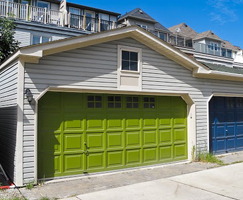 Think about it – that dull, nasty, ugly looking garage door is covering almost one entire wall of your home, and not just any wall but the one facing a good side. It would be a real shame to let such a great wall passes unnoticed due to old, pale dull garage door when you can put some life back into it just with the few strokes of your brush. Changing your hair may make a difference but changing your garage door color may change whole atmosphere and if that’s what you are after then this is your solution. If you are scared by this task since you have no experience with painting garage door do not worry since you are not the only one. In fact only few people out there have painted their garage door. We are only kidding. 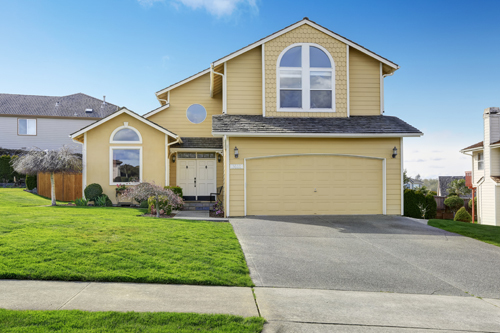 Even though you have never done the garage door coloring you should not be intimidate since coloring this part of your home is much similar to coloring your walls. Before you start painting you need to make sure you are well prepared. You need to get right kind of color, you need to get the exact amount of color, you need to get all the equipment and off you go. You can start breaking the routine!